Leigh Peele is a personal trainer and author from North Carolina who specializes in metabolic and fat loss research. Nationally published and held in high regard Leigh Peele is a leader of in the industry of nutrition and fitness. I have reviewed her first book, The Fat Loss Troubleshoot (which is awesome and a must read by the way). Question: What do you do and what lead you into this industry? Answer: Heh depends on the day but most of the time I find myself training people or writing to help them. I got in this field, and please forgive me for the cliché, to help people. I also saw that there was a hole in the industry for the types of things I had to say or more so the way I say them. Different people can help you in different ways. I think there is room for multiple cooks in the kitchen when they are all contributing something valuable to the table. Question: Do you only work in fat loss? Answer: No not at all, but it is my specialty. I read through a lot of research and I find nutrition and weight loss to be my constant draws. It also brings about the highest levels of gratification if I can be truly honest. I love helping someone increasing their athletic performance. I love helping a skinny guy add on muscle but, there is something though about seeing a person transform in front of your eyes and melt away into this new person. It’s downright addictive. Question: Your first release The Fat Loss Troubleshoot has been very successful, congratulations. Can you give a brief rundown of what that book is about? Answer: Thanks. Really it is a package/collection of multiple sources of material. It is way beyond just a book at this point and will continue to be so as it is constantly updated. In short, the package is about fat loss almost any way you slice it. Can you please everyone all the time? No, but you can answer them and that is what I have done. Everyone from bodybuilders to recovering anorexics are covered in this collection. There are program designs, explanations about various myths and nutritional strategies. It literally puts you in control of fat loss so that you don’t blindly follow a program no knowing why it didn’t work. Take something like Billy Blanks Tae-Bo system. Millions of people have bought this system and for some people it works but for most it does not. This is because people don’t understand how it is supposed to work in the first place. They think that a different dvd is going to cause a different reaction and it doesn’t work that way. You have to understand how fat loss works first and then if you want to get creative about how to go about it, fine. I am about teaching you the science; the facts. While I give you multiple methods to apply it the truth is that you have control to go even more outside the box and custom for you once you learned it. Question: It is currently unavailable due to updates correct? When will you re-release it? Answer: Correct. 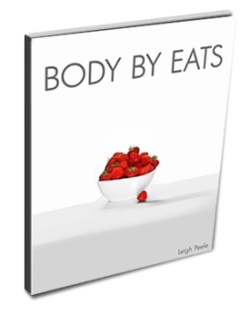 I am updating it for re-release but it will be available for the 3 day launch of Body By Eats as addition if the customer so desires to select it. It release to the public in regular fashion will at least be the beginning of next year. However everyone who buys ANY version of it will always get updates for free. Question: So let’s talk about Body By Eats. What is the basic premises of the book? 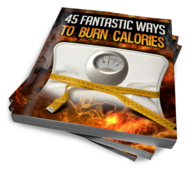 Answer: Originally I called it “The Caloric Burn Cookbook” because I was going to focus primarily on my research with caloric burn in everyday movement and how important general activity was to achieving your fat loss goal. Caloric burn is not static, is is forever changing an always will be. Cooking is an amazing way to achieve that burn and in turn you become connected to food in the right way. You only need to make manipulations of that in small amounts while trying to achieve your goals. The most important aspect though is about embracing food. I want people to embrace it, love to eat and cook amazing food. I want to remove the idea from their heads that healthy food is bland food. The best chefs in the world use whole fresh ingredients to make the most amazing food and most of the time the calories are not that high. It is all about perception. One twist thrown in the book is about the public health and food as a whole. I was writing the book I started to get really caught up in the constant discussions that were occurring about the food industry. Things like HFCS and the use of organics. I had personally been someone who bought organic foods and went out of my way to support local farming and businesses. I started learning more about it and realized, like most things in life, what I thought I knew wasn’t true at all. So the book kind of took this turn where it was about all of it. Embracing life, our health, activity, etc. Question: What kinds of things are you covering with Body By Eats that other people aren’t? Answer: Truthfully I can say that I have not read any of this stuff published yet and that in general my outlook on food and intake for results are not common. I am a little outside of the box all the way because I not only believe in balance and moderation with enjoyment, I can prove that it is good for you. I mix science with common sense and wrap it in a mouth watering dessert. I don’t think that has been done yet ha. Question: Do you feel the site is just as important as the book? Answer: It is crucial. In fact part of me was thinking of not releasing actual books at all but instead keeping it just to a site. I decided against that though mainly because different people have different time constraints. Not everyone is going to want to participate in the site as much as even they want to. I look at the book and the recipes as a introduction into this knowledge and a stepping stone for using the site and the forums to go deeper in that knowledge. Also getting a chance to talk to me 1-on-1 in a month is good to because a lot can be resolved faster with verbal dialogue. The site is crucial and I am expecting a lot of people who can offer help and those who need help. Question: Let’s talk about my favorite part, the food. This is a really nice collection of recipes right? Answer: Absolutely. With the first package alone you are going to receive 100+ recipes to work with and then each month you get a new book with 30 recipes. You will have a new recipe to use every day for the entire year and then some. There are also chances to win additional recipe books if need. These aren’t your standard run of the mill recipes either. They take macros into account like other books don’t. You can measure in grams or cups. You have all the stats you need and you have use and other members for support on how to do something if you mess up or get stuck. There will also be videos, general food tips, and more. Question: So your products are vegetarian/vegan friendly? Answer: There will be a specific download for vegetarians and vegans and there will be new recipe in the future as well. Body By Eats is 100% vegetarian friendly. There will also be other groups like Gluten and even other cultures like Thai addressed. Even kids will be getting a bonus manual as the months go by. Question: If you could only get one point across about Body By Eats what would it be? Answer: Body By Eats is about the concept of getting back to the good in life and not being afraid of food but embracing it. We are scared of food because of gaining fat. We are scared of food because of what it does to the earth to produce it. We are scared of food because of what we hear it can do to our bodies. I want to remove all of that and in the process give you good eats and the body you want. 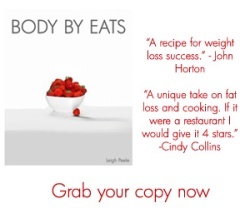 Question: I’ll look forward to hearing more about Body By Eats. Answer: Thanks for having me.